Sometimes people come into our lives and we feel as if we already know them. In cases like that, it is entirely plausible that we have a past life connection to the other person. Could this be indicated by tarot cards in a reading somehow? Yes, absolutely! 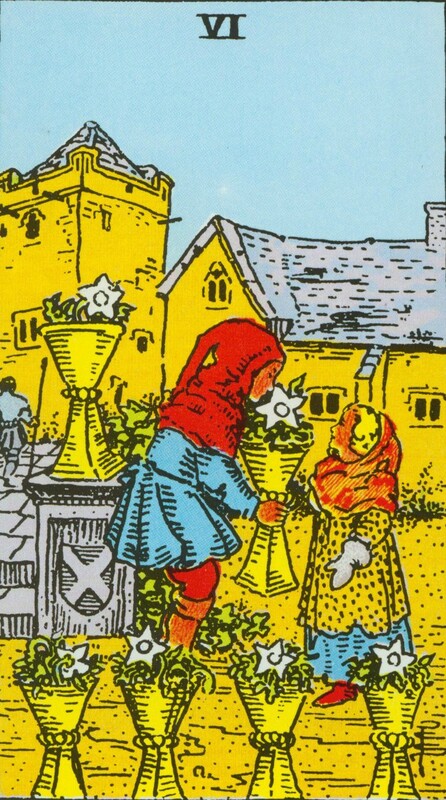 The main card from the Minor Arcana that indicates that we have a past life connection to another person is the 6 of Cups. If this card is paired with Justice or Judgment, we probably have karma still to work through with them. The Devil and The World can also indicate karmic soul contracts. In the first case, karmic debt is indicated and in the case of the latter, ongoing soul lessons are on the menu. 6 of Cups and Justice – these two people have come back together in order to find harmony and to refine each other’s personalities. It is likely that they were lovers in a past life. 6 of Cups and Judgment – these two people devoted themselves entirely to each other in a past life but most likely not as lovers. In coming together as lovers, they are opening up to entirely new soul growth possibilities. 6 of Cups and The Devil – one of these two seriously harmed the other person in a past life and has incurred a karmic debt which they need to pay off in one form or another. These relationship often include an element of fatal attraction since the past life memory might linger in the form of a deep-rooted but mostly intangible fear, yet the inability to resist the other person is almost complete. This fatal attraction itself is not evil – it serves its purpose, i.e. to bring these two people together so that healing and forgiveness can take place. 6 of Cups and The World – these two people have travelled together for many life-times and have a soul contract to help each other grow and develop. They have been together in many different type of family and relationship constellations already and now have a chance to finally complete the lessons once and for all. Fatedness that is not past life related is also possible. In this case, we have agreed to meet up with another soul before we were born. The main indicator for this sort of thing in the Major Arcana is when The Wheel of Fortune occurs. We want to see it together with either The Lovers or the Ace of Cups, 2 of Cups or Knight of Cups to indicate a fated love relationship. The most difficult relationships to break free of are those that carry a strong element of The Devil and The World energies, similar in Astrology to couples bonded together by the planet Saturn, the ruler of the sign of Capricorn.